Today’s Winners and Losers : Microsoft, Apple and You?! Today’s losers are Software Patents and the companies that use Software Patents to destroy the selfsame innovation and opportunities that allowed them to flourish. These companies, such as Microsoft and Apple, are burning the ladder that they used to climb from small company to successful giant. If IBM had used the same tactics against them, that these companies are now using against others to suppress competition, there would be no Microsoft or Apple. Frivolous and Expensive lawsuits would have crushed them before they had the chance to innovate and thrive, and the innovations they spurred would not have happened. We would still be on the Big Blue(IBM) time-line, which largely means the PC revolution and laptop revolution and now smart phone and tablet revolution, would likely have been delayed generations, or never happened at all. The push to computers as a consumer device and away from simply the business market, that young stupid and brash companies like Apple and Microsoft helped spearhead would not have happened in an environment of software patents and companies utilizing them to crush competition, secure market share, and generate revenue. There’s no telling the marvelous companies and inventions that have been delayed or destroyed by this present environment of software patents; destroyed by the current short-sighted business practice of making money being the only goal, and making a great product and earning customers that way, largely a fallen idea for suckers. So yeah today’s losers are: Software Patents, Microsoft and Apple. For trying the various Linux Distributions out there, for informing your representatives that you want software patents made illegal, and generally not jumping on the Windows 8 or I-phone or Itunes or Cloud bandwagon. Play around with them by all means, but buy into them not at all. Monopolies were outlawed for a reason. And that reason is coming around again. And many who have barred up the doors, and held back the river… will be swept away when the levy breaks. Yes they will. And I can hear it, starting… to crack. There’s something… satisfying in that thought. Well enough presentiment for this installment, you gals and guys have a great day and… stop by next time for more. ANOTHER Java vulnerability puts 1 billion users at risk?!!! Courtesy of Computer World, on the heels of a recently released patch to address a vulnerability in Java 7, a new even more serious flaw has been found affecting users of Java versions 5,6, and 7. But in short, if you don’t need Java on your computer, now may be a good time to disable or uninstall it. I’ve been meaning to get back into the habit of drawing regularly. While I’m obviously no Kyle Baker or Kevin Nowlan, and not going to make a living at this, the goal isn’t that. The purpose of this new segment ART FROM THE EDGE OF THE SEA is just to get back into putting down lines that hopefully day by day get better. The goal to see if a bad or rudimentary artist can progress… noticeably. The hardest thing about doing this on the computer is controlling the line, it’s a bit harder than controlling a pencil. 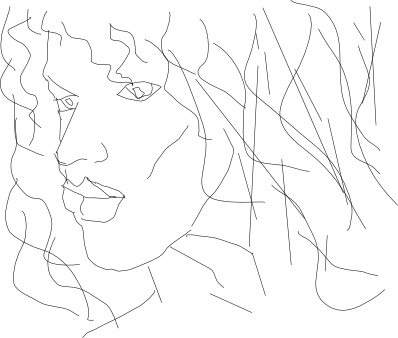 And I’m just using a crude basic illustration program and my touch pad (no tablet, no pen), so you can imagine it’s a bit like trying to draw with a brick. I’ll take it slowly, like this is the first day of my life. And this my first drawing. I’ll try and do one at least every other day, we’ll see how that works out.